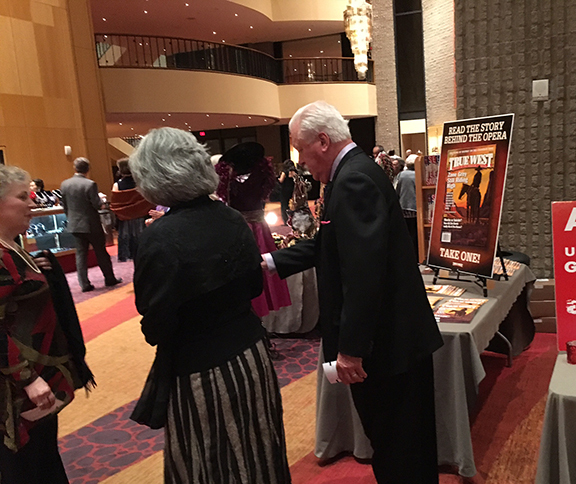 Spent Friday night in Phoenix while attending the premiere of the opera "Riders of The Purple Sage." 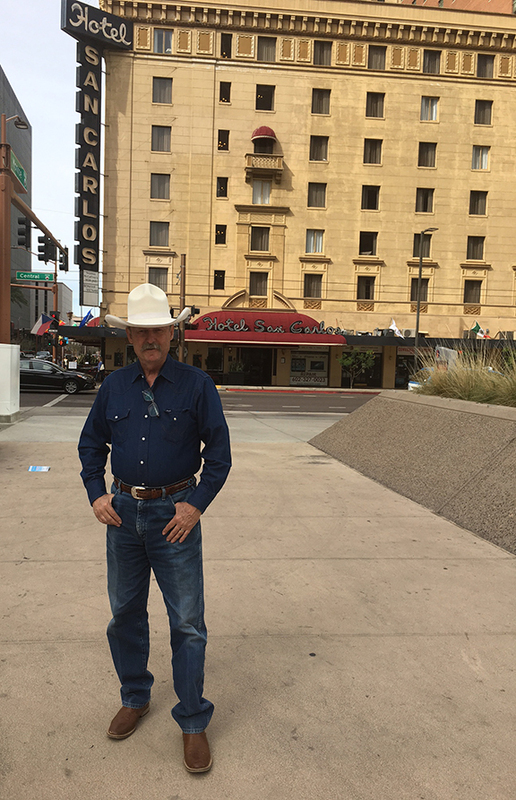 We stayed at the historic Hotel San Carlos where I have some history. First stayed here in 1961 as president of Kingman Junior High School (we came down to Phoenix for a state wide student council conference). Also worked as the art director at New Times Weekly in the late seventies, with offices on the second floor. Proposed to Kathy in one of the conference rooms (1978). Lots of memories in a very old building. Of course the big event was the sold out opera which premiered in Tucson last week and then moved up to Phoenix for the first of three shows last night. 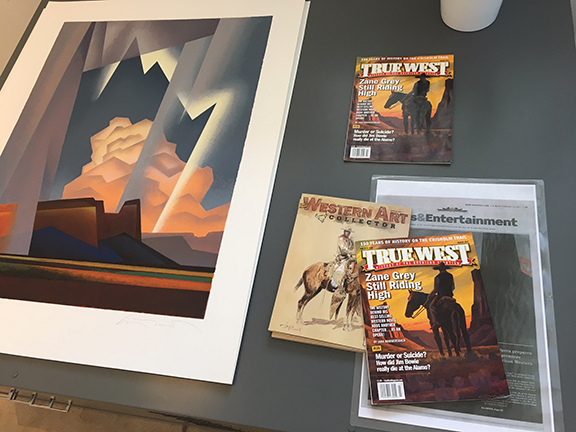 The Arizona Opera Company graciously allowed us to have a table with True West magazines on it, in the lobby, seen here, as two well-heeled patrons walk by. where the opera "Rivers of The Purple Sage" was performed. The absolute star of the show was Ed Mell's paintings which were used for backgrounds and mood, on a giant LED screen. The paintings moved and morphed as the drama unfolded. I thought the story was a little hokey but Ed's paintings were jaw-dropping in all their massive, colorful glory. We killed two birds with one stone, because, Ed had an art opening on Saturday and we took that in as well at his new space on north 10th Street in the Virginia historic district. 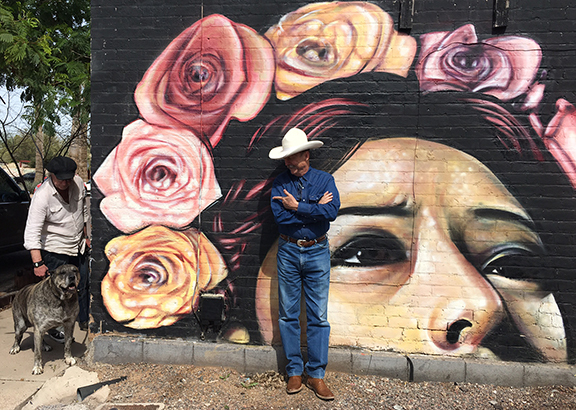 There is a very cool mural on the wall of the building to the north of Mell's studio and as I was posing in front of it, a big, bad, neighborhood dog photo-bombed me. What a ham! The dog, I mean. "We will adhere to 'Robert's Rules of Order.'" —Mrs. Plummer, our student council sponsor informing me of my business duties at my first meeting as president of Kingman Junior High School in 1961. I was so naive, I thought the rules were named after me. Was the dog's name 'Napolean'?